Apply today! Grants will be awarded until exhausted or the application deadline of March 1, 2013 is reached. Now is the time to obtain a grant for trees, shrubs, infrastructure, or other greening and beautification needs for quasi-public areas along The New Ave. Your community can make a difference, from a small tree that is watered and cared for to a full park renovation! Sligo Creek Stream Valley Park and Bike Trail I This park features a paved trail that links Wheaton to the Prince George’s County network of stream valley bike trails. Winding along the Sligo Creek, a tributary to the Anacostia, it is generally shaded by tall trees. Blue herons and other birds, as well as deer frequent the park. There are also several picnic and play areas catering to motorists and neighborhoods. 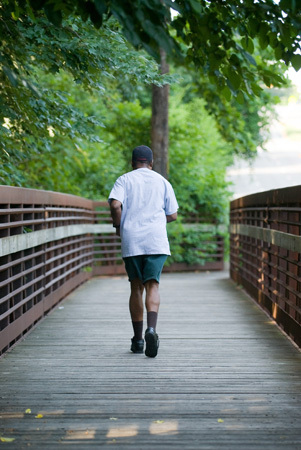 The trail may be accessed from Sligo Creek Parkway and New Hampshire Avenue. Hillwood Manor Neighborhood Playground I This M-NCPPC park is accessed off of 13th Ave or the Sligo Creek Trail in the Hillwood Manor neighborhood. This grassy picnic area includes tables, a grill, a water fountain, a playground, and a basketball hoop. Over the bridge, the neighborhood has built a garden space along the trail adjacent to New Hampshire Avenue. Both are ADA accessible. Becca Lilly Neighborhood Park I This M-NCPPC park is located off of Glenside Drive in the New Hampshire Gardens Neighborhood. Becca Lilly Park is named for Rebecca Erin Lilly, a Takoma Park teenager whose courageous battle with brain cancer touched and inspired many people. The 2-acre park is located on Glenside Drive just off New Hampshire Avenue, within the Long Branch Stream Valley. The park consists of a playground and access to the Long Branch Creek. Forest Park I This City owned park off of Prince George’s and Elm Avenue serves the neighborhoods off the Ethan Allen Gateway. This wooded park features picnic tables, a shelter, a water fountain, playground, basketball hoop and backstop. Takoma Park Recreation Center I This small recreation center is owned by M-NCPPC and programmed by the City of Takoma Park. The Center features a Gym with basketball court and two meeting rooms. 301-891-7290. The City offers team sports and classes; view activities website here. Sligo Mill Park I Also known as Sligo Mill Overlook Park, this M-NCPPC park is the site of one of the County Parks Department’s community gardens - Sligo Mill Overlook Community Garden. Plots are available through a waiting list by lottery, with the majority of the plots reserved for nearby residents. The garden is accessed off of Orchard Avenue, and serves the Maryland Gateway. Natural areas are generally undeveloped with the exception of “people’s choice trails”. A robust open space preservation program in the City, County and State preserves areas for local flora, fauna and residents. Long Branch Stream Valley I Long Branch runs along the southern boundary of the New Hampshire Gardens neighborhood south of Takoma/Langley Crossroads. It may be accessed at Jackson Avenue and near Becca Lilly Park. Each of these areas contains a bridge by which the stream may be crossed. Takoma Park Neighborhood Park I This natural area provides 6.4 acres of undeveloped open space on a bluff south of Sligo Creek Parkway and running down to New Hampshire Avenue. The park was acquired by M-NCPPC in 1973. Poplar Mill/Takoma Branch I The Takoma Branch, a tributary to Sligo Creek, runs along the northwest border of the Maryland Gateway commercial area, and was the most recent open space acquisition. This area is undergoing restoration evaluation and planning to remove trash and invasive species. Ethan Allen Gateway I In the summer of 2009 the City and State Highway installed two daylily beds with amelanchiors on either side of Ethan Allen. 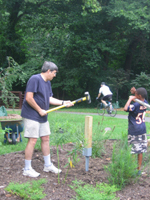 Hillwood Manor Neighborhood Community Garden I Members of the neighborhood association have adopted the area along New Hampshire Avenue from Erskine Street and past the Sligo Creek Bike Trail. In addition to a gateway garden, the neighborhood has beautified the wooded area, the bus stop, and the edges of a grassy clearing on the Avenue with trees and flowers. Holton Lane Garden I This garden includes the passive green space along New Hampshire Avenue north of Holton Lane and several beds maintained by the City of Takoma Park towards the eastern end of Holton Lane. Maryland Gateway Garden I The City of Takoma Park installed a small garden at this gateway to the City, County and State in the summer of 2009. New Hampshire Avenue Medians I On the highway medians south of East-West Highway, Prince George’s County has installed a beautification project at the request of the Ray Chillum neighborhood association that includes redbud trees, roses, and day lilies. North of East-West Highway, the City of Takoma Park has planted several medians, including one at Holton Lane and two at Sligo Creek Parkway with American native plants. The plantings include rosa rugosa, coreopsis, yarrow, joe pie-weed, and agastache. PEPCO substation I The City and residents, with a grant from Gorgeous Prince George’s planted hollies, red buds, and daffodils on this grassy slope bordering New Hampshire Avenue north of the Maryland Gateway. The trees will grow into a green buffer over time. Ray Road I A small field adjacent to the channelized Takoma Branch has been planted with native trees and plants by the Ray-Chillum neighborhood. Sligo Mill Overlook Community Garden I Located on Orchard Avenue in the Sligo Mill Overlook Park, this traditional community garden has plots available through lottery from the Maryland-National Capital Parks and Planning Commission. A percentage of plots are reserved for residents of the adjacent neighborhoods. Contact the Parks Department for more information.